I enjoyed reading your review, and can confirm that I too am enjoying a new lease of life in my music collection with these units. I especially like the soundstage enhancement and the kick that come through from drums and clarity/realism of voices and acoustic guitars. It's always good to hear that our reviews are appreciated. And perhaps more so when we find out that our views coincide with others who have actually tried the product concerned. The effect that the iTube has on the music has to be heard to be fully appreciated. Like you I was particularly impressed with the sound of the drums. A great piece of kit and I trust that our comments will encourage more to try it. I've just read your article on the Pro-ject PhonoBox. I must say iI've found it nice and infrmative. At this moment I'm looking for such a device, plus a good power supply. May you suggest a good PSU? glad you enjoyed my review of the ProJect Phonobox. Upgrading its PSU should be easy, you just need a beefier unit. The stock PSU puts out 16 Volts, so your replacement should do the same but choose a PSU that can deliver more than that diminutive 200 mA of current. Search for "16V AC/DC power supply" and choose something rated for 1A (that's 1000mA) or more. I'd avoid notebook PSU's as these normally use a switching technology which can introduce noise into the phono preamp. A traditional, linear PSU will do the job better. Do not spend more than 50€ or so...otherwise it should be better to sell the Phonobox and purchase a better preamp in the second hand market. Lucio, thanks for your interest in my question. I was looking for an option for valve amplifiers. And I really do not end up deciding, I know my Arcam A28 amplifier, when new, costed about 1400 dollars. And Audio Research, second hand, is approximately $ 3,000. Is it true that Audio Research has a sound similar to a solid state amp? I've read that in a forum. I've also read that an amplifier is approximately 30% of the sound, and the other 70% are the speakers. I have these Focal 807, and I have a living-room of 28 square meters. I do not know if I should invest in an amplifier, keeping these speakers. You can advise me on this issue?? I'd really like to have a tube amp, but do not know which option is most suitable. Better amp/tube amp or speakers. Thank you! Either you like tubes because they LOOK cool (hence they should be _displayed_, somehow) or because their sound is different from solid state gear...otherwise is a nonsense, to me. Audio Research does not sound like solid state gear (whatever this means), certainly it doesn't sound warm nor tubey, like Conrad Johnson, Jadis or other more classical vacuum tube components. Moreover, I wouldn't spend silly money on a new amp when the speakers are so small and inexpensive (considering room size and amp cost, respectively). I'd purchase a pair of bigger, floorstanding speakers (still Focal, if you wish) and keep that Arcam integrated amp. If you wish to try tubes and can't resist, try purchasing some small and inexpensive integrated amp from Yaqin or similar Chinese brands. Few hundreds of $ and you'll be able to experience the sound of tubes in your system. We reviewed some of these small amps on TNT-Audio. Finally, I tend to disagree with the rules you mention on amp vs speakers relationship. In a (budget-to-midclass) HiFi system, sound heavily depends on room and speakers placement (50-60%), speakers choice (30-40%) and rest of the components (10-20%). Many thanks for your thoughtful review of the new OPPO BD 105 player. It was good that you concentrated on CD playback. I have an old Philips DVD 963SA player which I use for CD, and it works well like that. I don't have the space (or interest) to have multiple players. However, one thing I've been thinking about recently is having a "hub"� for all digital formats from Blu-ray to computer but playing sound through my 2-channel hi-fi. One input would be my Humax Freesat STB. The problem with the Humax (and presumably other STBs) is that its digital sound output on HD is Dolby and a normal DAC doesn't like this. So my question to you is, does the OPPO permit multi-channel digital sound input and output to 2-channel analogue? I've not seen this mentioned in any review and it would be really helpful to know! I have now tried this out. Had to order toslink cable, which took some time. OPPO will play the output from my Humax just fine, even when it is multi channel. The OPPO does need to be set to downmix to stereo, but then the balanced outputs work very well. Hi, I was looking at your site and is very interesting. I've been searching for a hifi tube amp since 3 months, but I don't know wihich one to choose. I don't have now 2000 to 3000 dollars to spend. I could save money and wait or buy a 1000 to 2000 amp. I've read many reviews in audio magazines and I saw the Primaluna, the Mystere and the Cary Audio. Can you help me ?? Do you know someone who makes very good tube amps for less money of the traditional brands ?? The price of the Primaluna, etc ... is really the price of the parts ?? Or maybe you could recommend me used amp tubes to look for ?? I have an Arcam a28 that could work as preamp till I will sell it, and use Focal 807 speakers. Really thanks for your help!!! a commercial amp is _never_ the sum of its parts! Engineering and design costs, marketing, advertising etc are hidden costs which contribute to the list price of any HiFi component, including your Arcam A28 amp! If you're on a budget your best bet would be to have a close look at the second-hand market (e.g. Audio Research, Conrad Johnson, Primaluna etc.). I wouldn't recommend spending money on DIY designs or kits, they become almost impossible to sell in case of a future upgrade. The bottom line is either you search for second-hand gear or stick with your Arcam (which is a good amp indeed!) until the budget will let you afford something significantly better. Purchasing a _new_ amp for 1000-2000$ would be just a side-grade, not a reasonable upgrade. I was very interested in your review of this speaker.It is surprising how much worldwide interest is generated by high efficiency speakers these days.It seems true audiophiles need a speaker suited to their single ended valve amps. It appears you thought this speaker was a good performer but way overpriced.I agree and have noticed Acuhorn is now selling this speaker on ebay for the princely som of $1350 australian dollars (including free worldwide delivery).In view of their stated retail price of 3300 euros do you think this speaker represents value at this discount price. I think it's very good value at the ebay price. I'd recommend however that you listen to a regular sized single driver system beforehand as it's a very different experience to a regular speaker. The downside is much less bass and a rolled off treble. Large horn-loaded systems can help with the bass but the Acuhorn is not big enough to get really deep. The upside is much clearer stereo imaging and superb rendering of the midrange. In an ideal world I'd have a pair of regular speakers and keep a set of single driver speakers for listening to female vocalists. Unfortunately, not a practical proposition in my house! I have 4 stands of Atacama Nexus 7i. How many Atabites (kg) I have to buy? And do I have to buy also the spike shoes? I will put the KEF LS50 speakers on them! you could start with just a pair of kgs of Atabites as there's no need the stands to be competely filled with this stuff. The max allowed quantity for your stands is 12.2 kgs, consider the Atabite's come in 7.5 kgs tubs, hence you might need two tubs to completely fill the stands. The SpikeShoes aren't strictly necessary, as it all depends on the kind of floor you have. If it is parquet, the SpikeShoes are mandatory! I bought a tc-754 phono preamp a few days and it sounds pretty amazing, I am quite happy with it. I did have to open it up and have a peek, not that I know much about this stuff but I thought I would send you a pic since I had seen your review. One thing about tubes and why I prefer them. 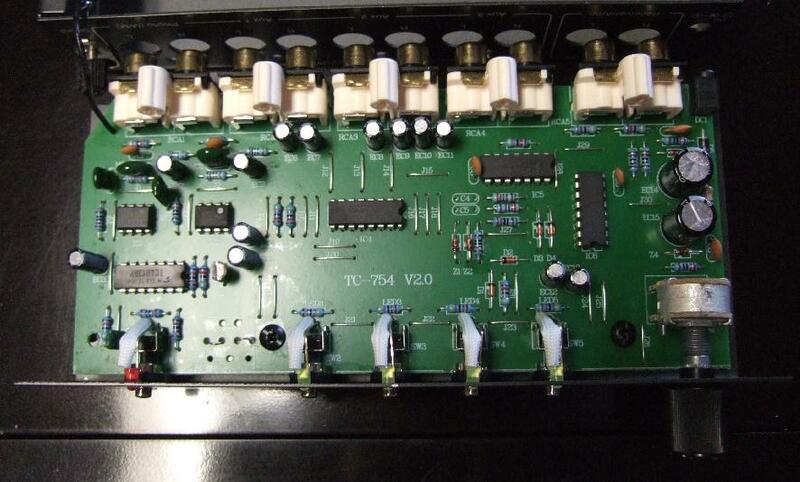 True it can be hard to tell what is inside an amp, tubes or transistors. But the truth can be known when drove to clipping. Tubes do not sound near as harsh when overdriven. That and the fact I can just plug in a new if needed is nice too. Plus, they just look cool. I think most people get the impression of tubes sounding warm from looking at them and not so much the sound. I just built a diy 12yg and it sounds very impressive for a $200.00 amp. And was fun and easy to build. And it was also great fun when I plugged it in and there was no smoke. Happy listening and keep DIYing! thanks for the feedback! Reviewing and writing listening tests is easy (and even entertaining!) when the products are as impressive as the Merlin TSM's. I fell in love with those speakers, literally. A clever, no-frills, solid design that deserves much more attention than they normally get. Not everyone's cup of tea, maybe, but definitely worth a try...and one of the best compact monitors of all time. Tom, I've read your review on tnt. I'm using an imac as a digital source for my liquid music (itunes + amarra). I've got a Beresford caiman as a dac, which features coaxial, optical and usb inputs, at the moment i'm using the built in spdif digital out (optical) from the imac to the dac. A good question that has been debated quite a bit. The optical out is a digital signal that is subject to jitter. The amount of jitter will be dependent on the computer used. I do not have an iMac or MacBook Pro and thus am unable to test the optical outs directly (the MacBook Air lacks an optical out). It is likely that using a high quality asynchronous USB to SPDIF converter like the M2Tech hiFace 2 will improve the signal arriving to your Beresford Caiman DAC and therefore the signal arriving to your downstream amp. It is difficult to assess whether you could hear the difference without some experience with the components in your setup and being able to make an educated guess as to the rate limiting step in audio performance. If possible, I would recommend testing the M2Tech hiFace 2. On a revealing system the difference between the hiFace 2 and the isochronous converter on the Beresford Caiman will be night and day. The optical out of your iMac will likely somewhere in between. If you do choose to test or buy the hiFace 2, I would recommend trying a separate power supply as described in Nick Whetstone's article. Clean power can really help, and if my experience with the MacBook Air is any indication, the performance of the hiFace 2 can be markedly improved for $10-15worth of parts and a few minutes with a soldering iron.